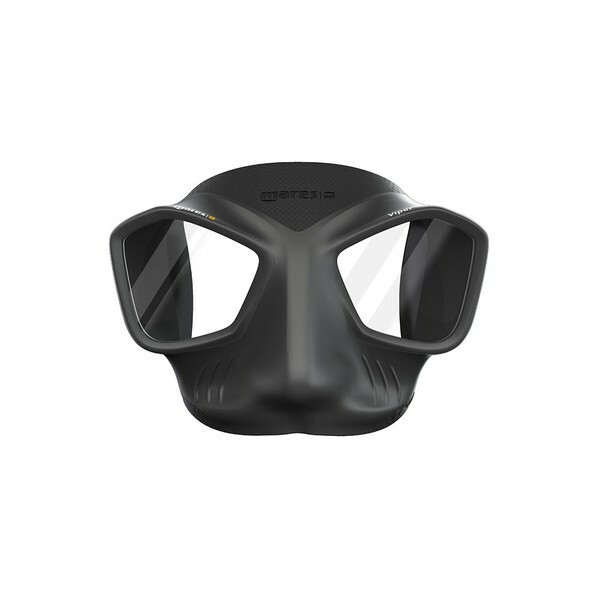 Mares introduces the new Viper mask; another revolutionary product, developed in partnership with the best athletes in the world and dedicated to the most demanding freedivers and spearfishermen. Mares designers have created a mask with innovative technical features and a unique, striking design. The SKIRT has been modeled with meticulous attention to facial ergonomics, making it suitable for all types of physiognomy. The surface in contact with the face has been carefully fashioned to offer superior comfort and to stay in position better than masks using the traditional extra inner lip. The skirt exterior has an attractive, sophisticated finish, and the inner surface features a special soft-touch / anti-reflective treatment. The frame is encased in the silicone of the skirt to provide a single highly streamlined shape that eliminates potential friction as you come back up to the surface. The lenses are positioned closer to the eyes in order to minimize internal volume and ensure a wide field of view. The product’s latest-generation silicones deter condensation, while the ergonomic buckles with double buttons on the skirt enable the strap to be adjusted precisely.